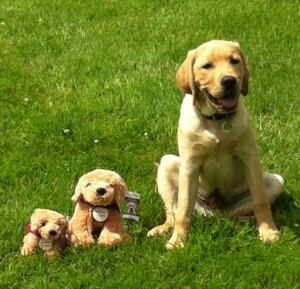 Echo was born on 10th February 2014 and has become ROYAL CANIN®’s second hearing dog sponsored puppy! 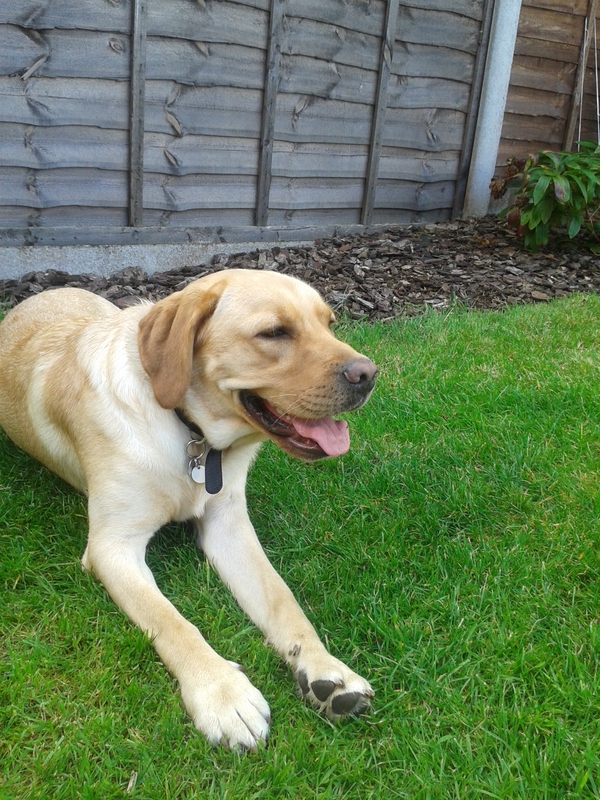 Echo is a Labrador, one of the breeds commonly used by the Charity as they tend to respond well to the particular demands of a life as a hearing dog. At eight weeks old, once he was fully weaned and inoculated, Echo was ready to start the first stage of his journey to becoming a qualified hearing dog: socialising. 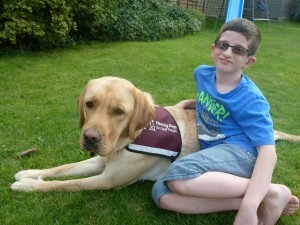 He was placed with experienced socialising volunteers Simon and Ute Porter at their home in Buckinghamshire. Echo settled into his home quickly and soon became part of the family. 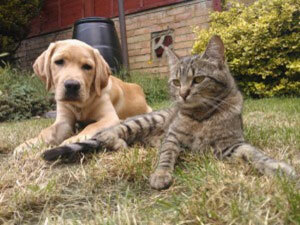 Echo loves to play in the garden, although currently his favourite activity is to play with Simon and Ute’s cat Rosie! ROYAL CANIN® has worked with national charity Hearing Dogs for Deaf People for several years now, and Crufts 2014 saw the launch of the competition to name the 2014 hearing dog puppy whose training ROYAL CANIN® will support. The competition was officially launched by 11 year old Oliver, the recipient of our first hearing dog puppy, Jazz in 2012. Voting continued on our website until the end of June 2014, receiving over 200 votes in total. 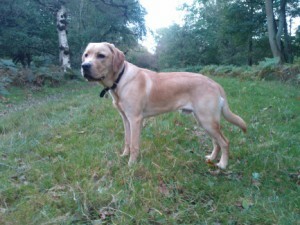 During March voting too place to name this beautiful golden Labrador puppy. The chosen name Echo is voted for online by the public. 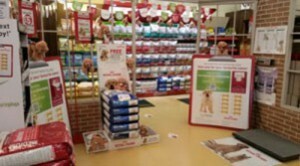 Late March saw the launch of ROYAL CANIN®’s in-store activity to support fund-raising for Hearing Dogs, with an on-pack promotion on dog food giving the charity a cash donation for every pack purchased. 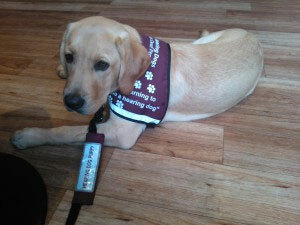 This donation will go towards supporting the 2014 puppy through its training to become a life-changing hearing dog. One National winner was selected from all the entries. Congratulations to Mutley’s Pet Supplies in Swaffham. 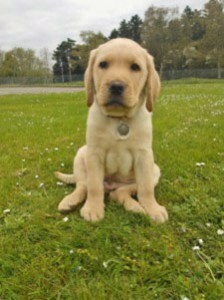 Now 13 weeks old, Echo attends puppy classes every fortnight at Hearing Dogs’ training centre in Saunderton, Buckinghamshire, where trainer Kelly tells us he is making good progress. He is a really well behaved dog who enjoys meeting other dogs and people. His calm nature but keen interest means that he is progressing well and has learned to sit, lie down, wait and be called by voice and hand signals. Our 2014 puppy diary will have regular updates about Echo’s training to become a hearing dog.hearing dog. It is important that he is familiar with a range of everyday household noises which might range from the telephone, to a food mixer, hair dryer and lawn mower. He will also be gradually introduced to places he will expect to work as a hearing dog, for example restaurants, shops and supermarkets. He will also get used to travelling in a car when he’s out and about, which will prepare him for a life as a working dog. 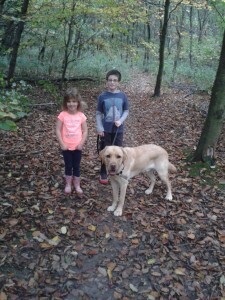 Echo is progressing well with his training and is a happy, confident dog. The difficulty of his training has gradually increased and he has been learning to deal with more complex situations, such as travelling by bus and train and visiting busier locations such as city centres. He has recently passed his 2* award on his 6 month birthday – a great achievement for such a young dog. Echo is now allowed to wear his smart new training jacket. Being a Labrador Echo enjoys his food, and looks forward to his ROYAL CANIN® meals, which help to keep him fit, active and in tip top condition. ROYAL CANIN® offers complimentary kibble to support all Hearing Dog puppies throughout the duration of their training. Socialising is a key step in a puppy’s journey to becoming a trained hearing dog. In these crucial first months puppies are taught basic obedience and manners and learn to deal with a range of everyday situations. Our volunteer socialisers are so vital to the work we do. Whether they are experienced socialisers, like Simon and Ute, or first-timers, we’re here to support them all the way. It’s a challenging job but rewarding, as volunteers gain the satisfaction of knowing that they were part of creating a life-changing partnership. We simply couldn’t do it without them. Echo is a calm, intelligent young dog, who loves life. Echo has recently had his first formal assessment. This is an important step in a puppy’s progress to becoming a qualified hearing. The assessment is designed to evaluate a puppy’s progress and assess what elements of its training Echo enjoys, which in turn will give an indication of the areas of his future work as a hearing dog he is likely to respond to best. This is then used to identify the type of household and lifestyle that dogs like Echo would be best suited, and help in matching the dog to a potential recipient. At almost 10 months, Echo is turning into a fantastic dog. Echo passed his 2* obedience assessment on his 6 month birthday with flying colours! His socialiser Simon as let us know that Echo has enjoyed travelling on a small boat on his holiday in Devon and has also now mastered travelling on the bus and train without any fuss at all. Echo is growing fast and weighs a healthy 26lbs. He is very enthusiastic in his training, although down a bit with other dogs as apparently every moment of every day is playtime if another dog appears! 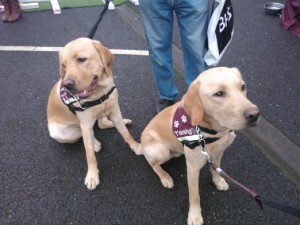 Echo (on the right) meeting up with his brother, Harvey (on the left) at the Hearing Dogs Christmas market weekend. Happy Birthday Echo! On February 10th Echo will be 1 year old and has reached many remarkable milestones in the first year of his life. He is progressing very well with his training and is working in an increasingly challenging range of locations, which will become commonplace to him when he is a fully trained, working hearing dog. He is confident in shops and restaurants, and really enjoys his test visits to the local coffee shop. He is also now venturing onto public transport including buses and trains, and being taken into busier situations such as city centres and crowded events. To broaden his experience of a wide range of people, Echo is a regular face at local fundraising events. His calm, easy going personality makes him a hit with all ages, and he recently won over a group of boy cubs. 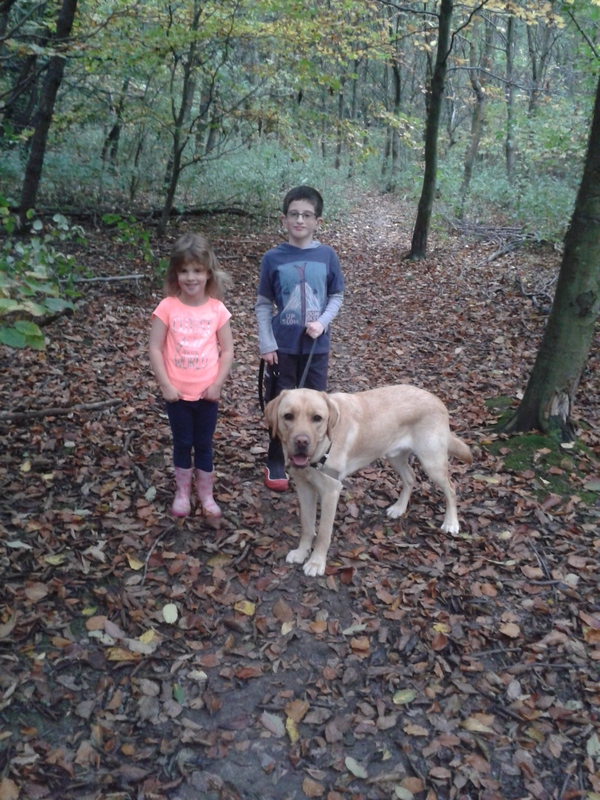 They were so taken with Echo that they have recently completed a sponsored walk to raise funds for the Charity. On December 16th Echo achieved top marks in the Hearing Dogs 3* Puppy Star Awards. The Star Awards provide a structured and relevant training programme that identifies the standards of hearing dog puppies as they develop, encourages age appropriate training and prepares the puppy for their potential future as an assistance dog. The scheme also looks to offer reward and recognition of Echo’s socialisers hard work and commitment in supporting his training. Echo achieved distinction – the highest mark, which requires a score of 59+ out of a possible 65 points. Well done Echo and his socialiser, Simon!! Of course, there’s also plenty of time for fun! Echo enjoys long, muddy country walks and weekend runs on the beach. 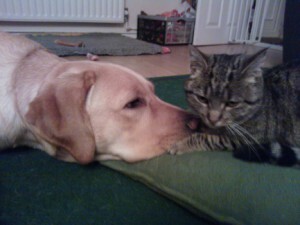 He is incredibly sociable with other animals and enjoys meeting his friends at fortnightly puppy classes. His relationship with the family cat is generally more “on” than “off”, with the biggest debate over who gets the dog bed! Echo is very clever, and one morning Simon woke up to find the cat in the dog bed and Echo bedded down on the floor with a cushion he had moved from the sofa! Echo will be neutered soon and in a few months will start his sound-work training, where he will learn to respond to the important sounds and danger signals that will enable his deaf recipient to lead an independent life. This will be the final stage in his training and we hope that Echo will be fully trained and ready to transform a life in summer 2015. 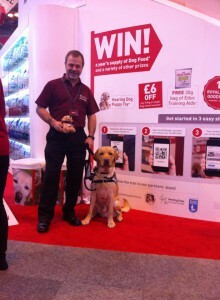 Echo popped over from the Hearing Dog stand to see us at Crufts this year with his socialiser Simon. It is exactly a year ago when we launched our competition to name our 2014 Hearing Dog Echo so it was nice to see him enjoying his first trip to Crufts. This year as part of our QR trail we were giving away toy Echo puppies for anyone who scanned the trail post on our ROYAL CANIN® stand. wouldn’t hear or see them. This made bedtime traumatic. It also compounded the tiredness that deaf children experience anyway through being immersed in noisy classrooms and working so much harder to hear lessons and instructions in school. A couple of weeks after Echo’s arrival, Zach announced out of nowhere that he loves sleeping now because Echo protects him and won’t let any bad people or monsters in the house! Amazing! Echo alerts Zach to all sorts of things. He wakes him up in the morning when the alarm goes off. We set a timer for things like screen time or how long left to do homework and Echo alerts Zach when the time is up. Echo’s favourite thing to do is to fetch Zach when I tell him to….he loves to work and has so much joy in his face when he does it! toy and a lot of tail wagging! He’s a big hit in the school playground and Zach even felt confident enough to tell his year group and teachers all about Echo at the end of our training week. We were so proud to see that side of him come out!